Felix Limo outsprinted fellow Kenyan and 2005 champion Martin Lel in the last 200 metres to win the men's race in the London Marathon on Sunday. The two runners, who pulled away from their main rivals in the last three miles, were locked together until Limo stepped up the pace in The Mall. The 25-year-old's winning time was two hours six minutes 39 seconds. 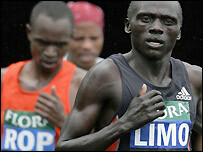 South Africa's Hendrick Ramaala finished in third while the legendary Haile Gebrselassie was ninth. "I had to use my brain to win that race," said Limo. "I felt good although the conditions were not great. But when the conditions are not perfect, you have to use your brain as well as your legs." Limo, running for the first time in London after recording wins in Rotterdam, Berlin and Chicago, came home two seconds ahead of Lel, with Ramaala 14 seconds adrift in third place. Lel said: "I had a really good race. I'm not disappointed with second as that sort of thing is part of the race." The leading men's contenders, including four-times world 10,000m champion Gebrselassie, remained tightly bunched on a cool, wet morning until the 30km mark when Kenyan Evans Rutto accelerated to the front. Rutto was unable to shake off the pack and the next break came at 38km when Kenyan Rogers Rop and Lel moved away. Ramaala responded before Limo and Lel made their final move. Ramaala said: "With not long to race I wanted to push on, but I felt a slight twinge in my hamstring." Marathon debutant Peter Riley was the first Briton home, in 12th place. Riley said: "It was a new experience for me - I've only ever been over 10k three times before. "I was surprised by the early pace as I've never run so slow before. I began to feel some muscle pain at about 18 miles but I had loads of energy."